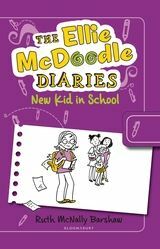 You may have heard of Dork Diaries, Diary of a Wimpy Kid and Tom Gates, all brilliant books, well now there's The Ellie McDoodle Diaries, a cool new sketchbook/journal/diary recording the life of Eleanor McDougal known to friends and foes alike as Ellie McDoodle. She's given the name of McDoodle as she LOVES to draw (like me). I was lucky enough to be sent two books in these awesome new set of stories from Bloomsbury: Have Pen, Will Travel and New Kid in School. In Have Pen, Will Travel, Ellie is stuck with her horrible aunt and uncle and her mean cousins. During her time with her irritating enemy and cousin Er-ick she soons discovers that maybe these awful relatives of hers aren't what she actually thought. These two books are sooooo good. The drawings are brilliant and help bring the stories alive. Without them the story wouldn't be the same. Despite that, the writing is great telling different hilarious stories. Both stories guarantee at least 1,000,000 laughs throughout the book. Ellie gets herself in bad situations - lonely, angry or upset but always there is something good in her busy life. Ellie loves art and is pretty clever. I love both of the books however Have Pen, Will Travel is my favorite of them both. I recommend this to anyone who's fan of Dork Diaries, Diary of a Wimpy Kid or Tom Gates (best for the 7-9 year old girls) or to anyone who loves art!! Thank you to Charli from Bloomsbury for sending me these great, funny stories for review.